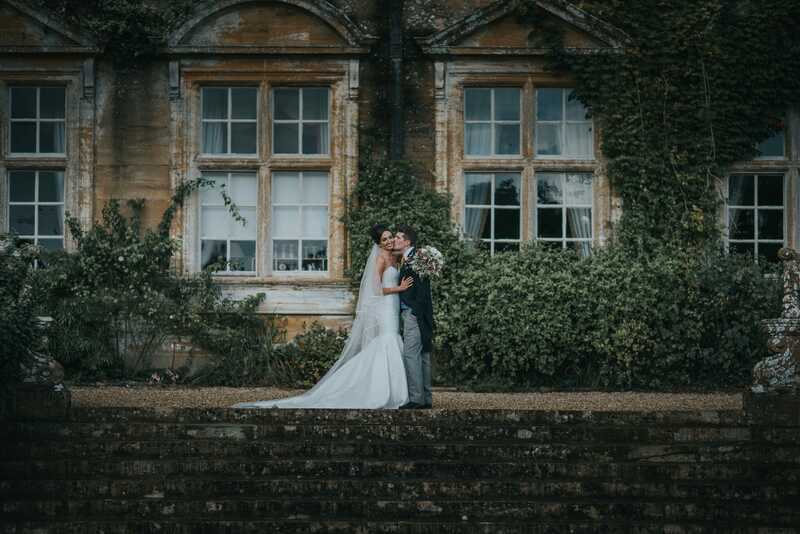 Today’s real bride Blog post is from Katy and Luke Hedley who celebrated their wedding last September at the stunning Brompton House near Somerset. Katy and Luke got married almost 10 years to the day that they met at university. Luke proposed on a rowing bow in Central Park, New York in April 2016 and shortly after Katy set about planning her special day including all of her favourite things – Rose Gold (a girl after my own heart), Whimiscal romance and of course – New York! I already knew that I wanted a Suzanne Neville dress and was so pleased to have got one of the last remaining appointments at the Suzanne Neville designer day at The Bride. Having known so much about Suzanne Neville after my sister got married in one of her dresses, done lots of research and following her on Instagram I think I was a little bit star struck/giddy when I met her in real life! It was such a surreal yet incredible experience trying on wedding dresses and having Suzanne Neville herself there for the appointment. It was in fact Suzanne who picked out the ‘Orsay’ dress and suggested I try it on. When she bought it in the room I instantly fell in love with the material, especially because it had Roses embossed on the jacquard ( Katy’s maiden name is Rose, so it was just meant to be!) and couldn’t wait to try it on. I barely even had the wedding dress on, let alone done up and I remember turning to my sister with the biggest grin on my face and we both said ‘this is the one’! I felt incredibly lucky to have Suzanne create a bespoke version of the Orsay dress for me – she changed the shape of the top of the dress to a sweetheart neckline and added a satin belt around the middle. I also decided to opt for ‘made to measure’ to get that perfect Suzanne Neville fit. Suzanne also drew and signed an amazing sketch of me in my bespoke Orsay dress which I cherish and have framed up in our flat in London. I chose a Katy chose a two tier veil with thin satin edge from The Bride. Shoes were L K Bennett sparkly/glittery heels. On the jewellery front I kept it quite simple to let the dress speak for itself – no necklace, a rose gold Monica Vinader bracelet and diamond earrings that Luke gave me on the day. Katy talks us through how she picked the venue as well as how she styled it to perfection! The Castle House, the Library, The Great Hall, The South Terrace, Ballroom and The Stables not to mention the stunning grounds – the venue has so many rooms throughout the course of the day that we fell in love with it from the second we walked in and knew this had to be the place we got married. Regarding styling, the venue is so stunning so it was just a question of complimenting the beautiful grounds and buildings to suit our wedding/colour theme. I had a very clear idea on what I wanted for flowers – whimsical, free flowing and neutral tones with lots of foliage including my favourite flower roses (of course being my maiden name! ), our florist Emily did the most incredible job and truly bought my vision to life. My Mum and Dad helped a huge amount with their talents in making things for the day – between them they handmade bunting, table runners, favours, table plans, the list goes on! We certainly couldn’t have done it all without their help! We also had our friend commission our table drawings of Luke and I on various holidays over the years which were amazing and such a lovely personal touch. Looking back on the whole experience, I feel so incredibly lucky to have found my dream dress at this wonderful boutique in St Albans. After my sister got married in a Suzanne Neville dress, I knew this would be the designer for me too so I went along to the Suzanne Neville designer day hoping to find “The Dress”. 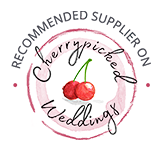 I felt so lucky to have had the expertise of The Bride team plus Suzanne Neville herself pick out the stunning Orsay dress for me, needless to say I knew instantly it was the one! Every Wedding dress appointment at The Bride was nothing short of wonderful, the team were always so welcoming, provided genuine and honest advice, extremely knowledgeable and skilful whether that be with taking measurements or the seamstress Rani, overwhelmingly accommodating with booking appointments, even offering their time outside of shop hours to help me pick out a veil, the list goes on! Every Wedding Dress appointment was such an exciting experience at The Bride, not just for me but for my sister and Mother too, and I am forever grateful to them all! I could not recommend this Bridal shop enough. Sincere thanks to you all for a Wedding Dress journey I will never forget! Overall and most importantly enjoy the Wedding Planning, it’s the most magical time so enjoy every moment and continue celebrating along the way, because you’re engaged and soon to be married, so why not! A huge thank you to Katy for writing this blog post for us. It was an absolute pleasure working with her last year and to see her finished look is just magical!